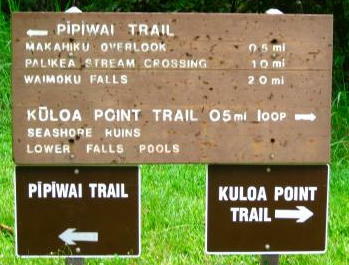 This sign shows a general layout of Kipahulu. On Maui, when you get tired of lounging on the beach or by your hotel pool, it’s likely that you’ll turn your sights to Haleakala, the volcanic mountain in south Maui. Whether you head up to the summit to watch the sun rise over the crater or to coast down on a bike, the Haleakala National Park that you think of is most likely the barren, moonlike crater. 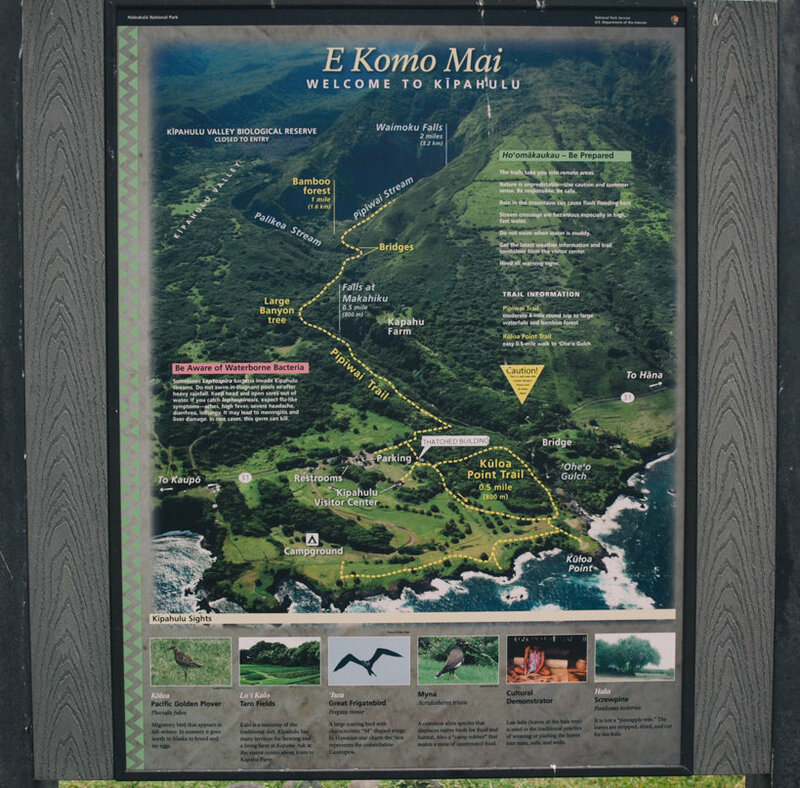 Fewer people know that there is another unit of the National Park about 12 miles past the village of Hana on the (in)famous Road to Hana. 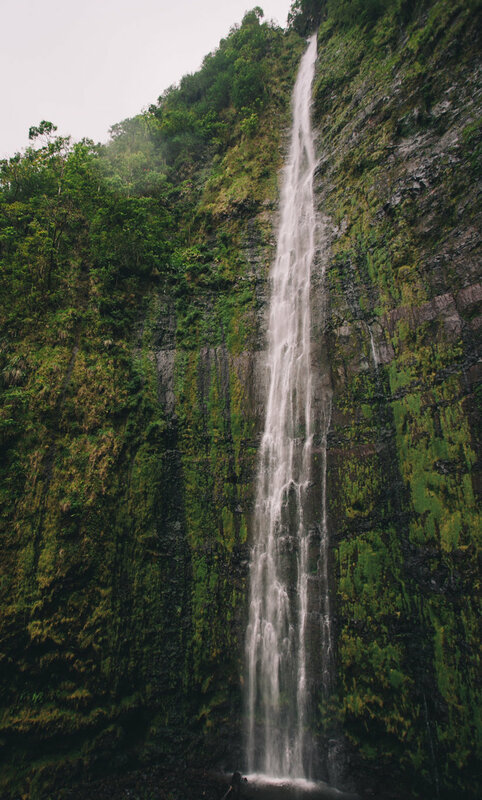 In the coastal Kipahulu unit of Haleakala National Park, you’ll find the so-called Seven Sacred Pools (they’re not sacred, and neither are there 7 of them). The area is officially known as the `Ohe`o Gulch. For those with more time, the Pipiwai Trail is worth the effort. Look for this sign at the trailhead. The trailhead is at the parking lot at the visitor’s center. Entrance to the park (required for parking) costs $10 per vehicle and is valid for seven days, including at Haleakala summit. Just keep your receipt! The Bamboo Forest is, for lack of a better word, simply magical. Photographers will want to bring a tripod! You’ll cross the highway, then continue about two — largely uphill and often muddy — miles to the waterfall. 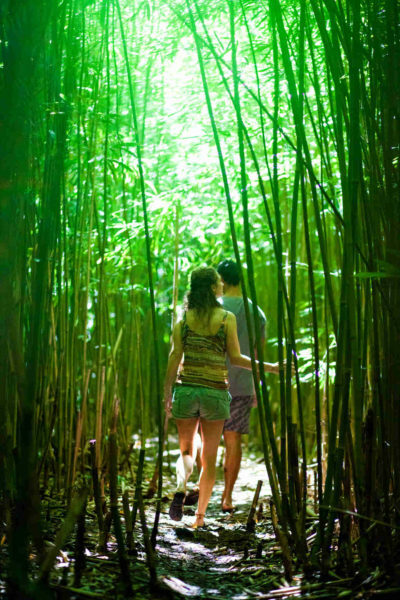 Along the way, you’ll cross several streams and walk through native vegetation, including a fascinating bamboo forest. Waimoku Falls is 400 feet tall, and gorgeous! The soil is clay that gets very slick after rain, and keep in mind that this is very much the wet, rainforest side of the island. Shoes with good tread are a must, and hiking poles come in handy on the steep sections. Right before the waterfall, you need to cross the stream. Don’t be afraid to get your shoes wet in the stream if you need to. Better to have wet socks than slip on a rock and get badly hurt. As enticing as it may be to take a refreshing dip, heed the warning signs about debris. Even a pebble can hurt you after it falls 400 feet! Be safe, have fun, and make sure you don’t forget your camera!